Our kitchen setup is quite traditional. We have a beautiful Dacor range that we installed several years ago when we bought our home, a respectable stretch of concrete countertops where stains and acidic rings indicate frequent use, and a few other high-tech pieces that I’ve grown to love. In past posts, I’ve introduced you to Alex and you know that I rely on our Vitamix daily. Still, there is a short list of rather low-tech items that I’ve come to depend on and find useful everyday. Each year new kitchen gadgets emerge. People grace me with kitchen gifts at the holidays and after a time, I return to the same simple tools. If I was setting up a new food space, these are the top ten things that I’d have within my reach. 1. Mixing bowl with handle and spout – This wasn’t even given to me. Rather I exchanged a gift for this wonderful device. Not too heavy. Easy to clean. So practical. 2. Microplane grater – MJ over at the kitchen store followed me around one day and said, “we’ve got something that you need.” She knows me well since she is the one who handled my bridal registry 20 years ago. She was right. From parmesan to ginger, this is a daily use. 3. 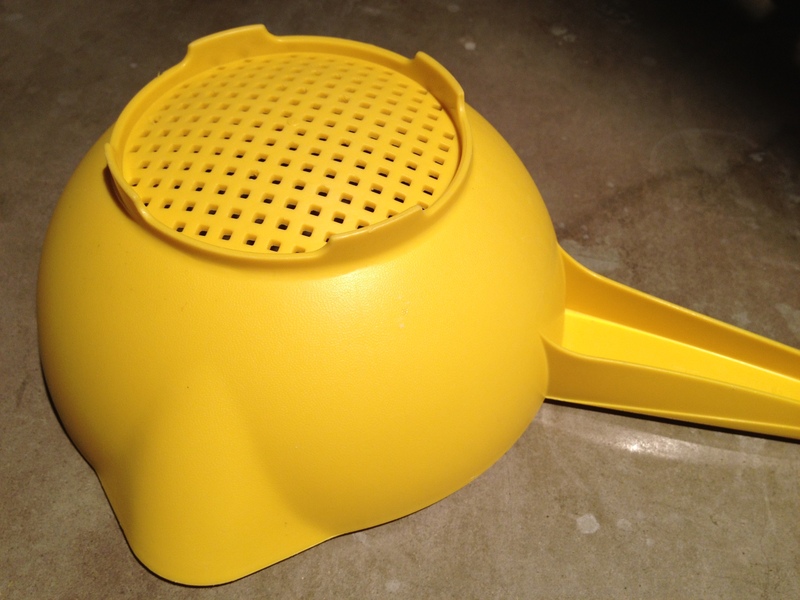 Plastic colander – Definitely a most used item. Mine came from a tupperware party years ago but now with our daily kefir routines, it’s important to have one that doesn’t react with the culture. 4. 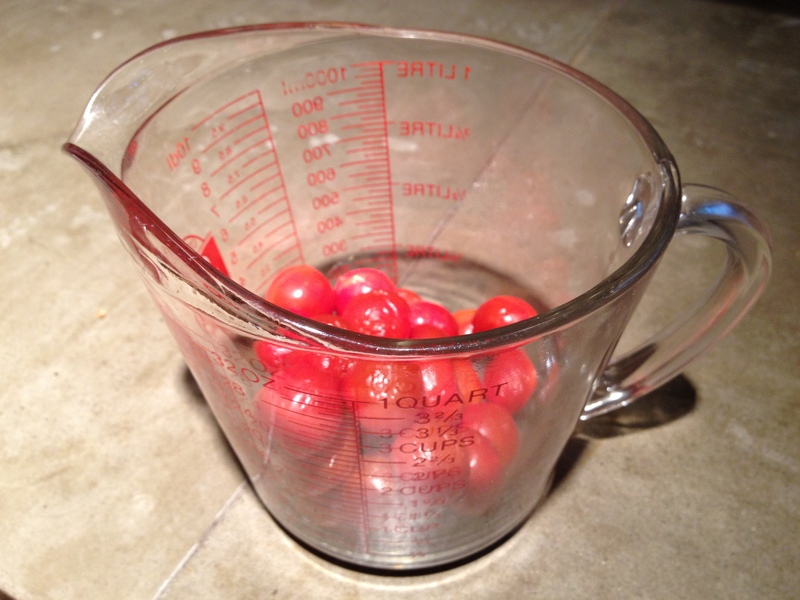 Glass measuring cup – I’m sure everyone has one and if you don’t, do go to your second hand store and get one. Everyday useful! 5. 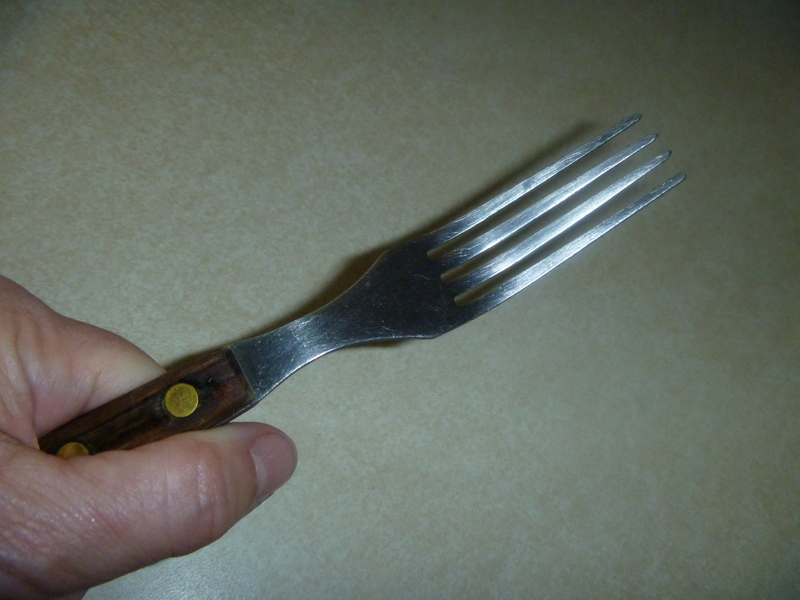 Fork with wooden handle – okay, this is my quirkiness. For most this should say, good wooden spoon but as you know from previous posts, I glide about the kitchen with this in hand. 6. Cutting board(s) – In a perfect life, I chop once a week making it ever so efficient to throw together meals and snacks. Alas, my life is far from perfect and I chop daily. It is a zen meditation of sorts. I have several but one has a hole in the middle which is great for overlaying the sink. 7. Good sharp knife – I don’t own expensive knives but I am blessed with a husband who keeps them sharp. We also have a truck service that stops in different locations to do sharpening. The next food-related class that I take will be on how best to use knives. 8. 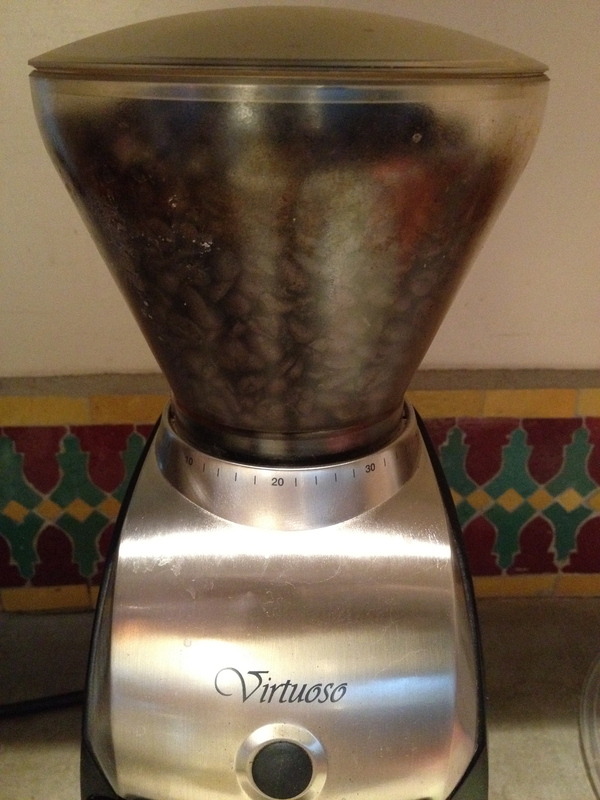 Coffee grinder – I need a way to feed Alex and I love the scent of fresh ground beans. 9. 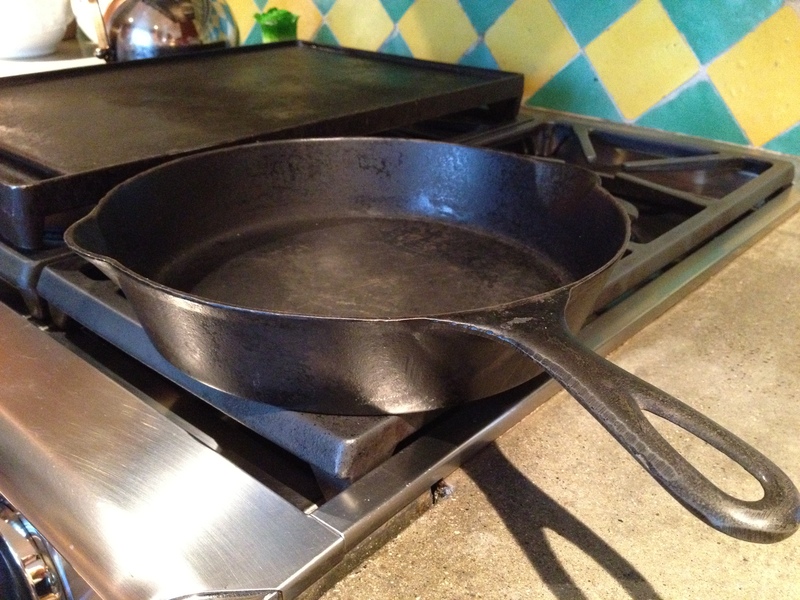 Cast iron skillet – Even heat. What more can I say? My brother-in-law left it at our house years ago and I’m never returning it. 10. 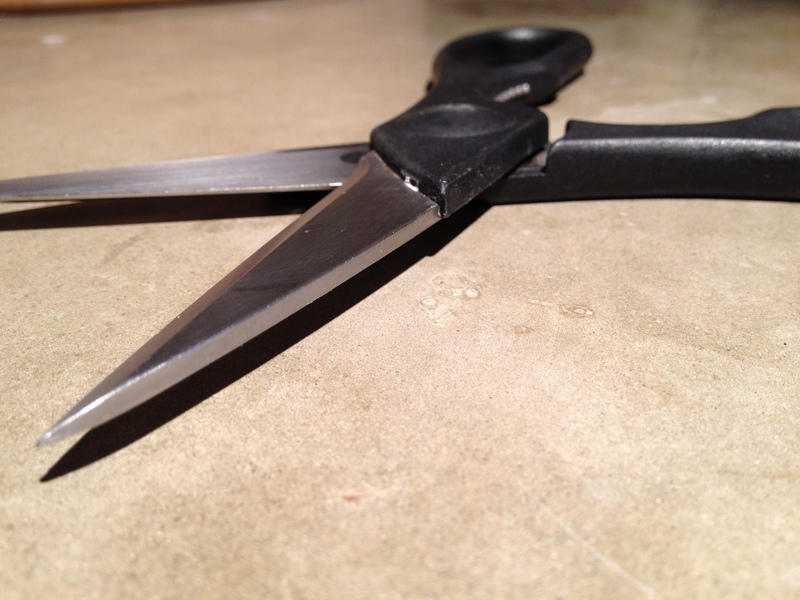 Kitchen shears – Great for running out the door to snip thyme or to dice nori on top of a salad. The biggest challenge with these is keeping them out of the craft room. There are more than ten that I could have written about – corkscrew anyone? I’d love to hear from you. What are your go-to kitchen accessories? Thanks for these simple tips Tammy. I don’t have a mixing bowl with a handle and spout–that could be handy. Love my Vitamixer every day too. Have a great weekend. Keep it in mind when you are setting up Michael’s kitchen!! Happy Memorial day weekend. I’m with you on most of these items (not the fork, sorry to say). On my list, were I to create one, I’d add a little hand-held knife sharpener that’s so easy to use, I actually use it all the time. Using sharp knives is so nice! Hope you’re doing some fun cooking and eating this weekend. Yes, I have much to learn about knives. Your list pretty much matches mine, but I’d add a Le Creuset dutch oven, a Japanese rice cooker, a very simple wooden spatula, and a Vacu Vin winesaver. I don’t own the dutch oven but have heard that from many. I do have the rice cooker (not used often), love spatulas, and the Vacu Vin!! Yes, I need a knife skills class too. I’ve got the basic idea, but I’d love to be faster and more efficient. 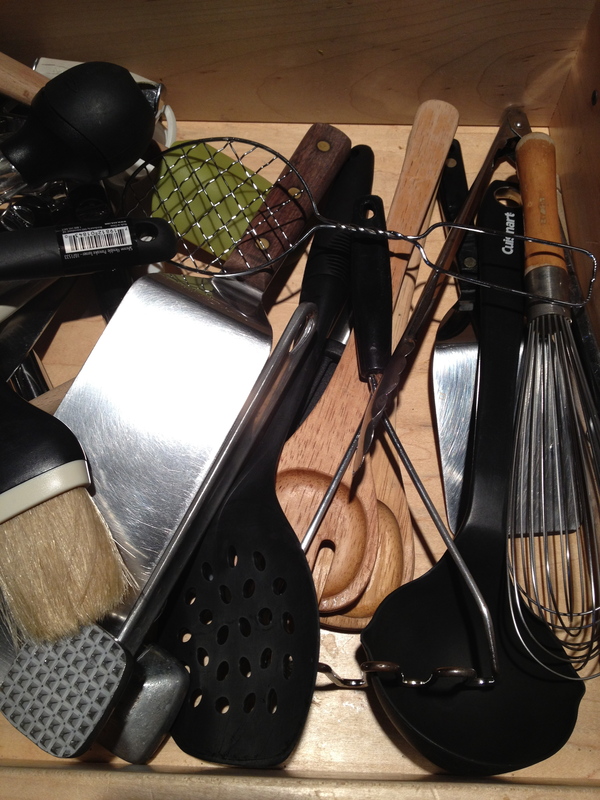 And I love the microplane grater…so many fun uses! Yes, I think I could really improve my efficiency by learning better technique. Your list is very much similar to mine. The only item I would add would be my mandoline for slicing. I can get more slices out of tomatoes with it, as well as thinly slicing zucchinis and eggplant for grilling. The coffee grinder is also good for grinding whole spices (I enjoy making my own spice mixes as well as curries). Excellent list! I do have a mandolin but forget to use it as often as I should. And also my salad spinner. oooooh antique juicer in clear glass sounds very interesting. Photo? ohh, it’s beautiful. tempted to bid but won’t. Yep, have one of those although I have been known to use the microplane for that also. I love your mixing bowl – and the cast iron skillet? Can’t make a good steak without it… although that’s not on your menu is it? My kitchen space is my home base. Without my tools and my routine, I really feel lost. With the exception of your fork I rely on all the same things you do. I’d have to add a good, large, thick bottomed stainless stock pot that’s a real workhorse around here, along with a big, lidded Tupperware bowl for making and storing bread dough. Just goes to show that I needed a top 12 or top 20. Yes, a thick bottomed stock pot gets used every single week. So my kitchen is well equiped, then! 🙂 Currently, I have 9 outta ten gadgets listed (well, my collander is metal but same thing) and the only reason we don’t have a coffee grinder is we don’t drink coffee. I would add hand can opener, hand citrus juicer, french rolling pin and whisk. If you are every looking for amazing knifes, check out Cutco. We saw them at a “show” and immediately thought “gimic” but learned quickly we were dead wrong and they thruend out to be THE best knives I have ever used. No sharpening required and they are guaranteed for life if you damage them. Their kitchen sheers can cut a penny! Wow, haven’t heard about cutco. I use the things you mentioned although my rolling pin doesn’t come out often. Guess I haven’t been making pizza. although i don’t spend much time in the kitchen, i can see the glory of that mixing bowl! that may become my next kitchen purchase. 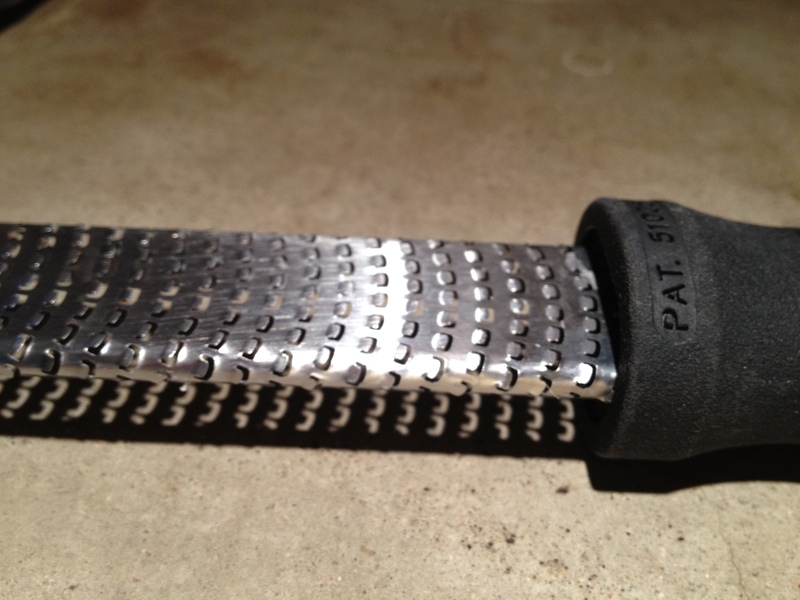 micrograter, too…. ahaha. Good catch Daisy fae. Yes, good for safely walking to the herb garden. I love lists, and this is a good one. I have most of these items, but not all would be my top ten. I’ll have to think about that. Thank you! My go-to mixing bowl is my pyrex 4c. size measuring cup. I find that I use that for so many things to mix and measure but your light green one made me happy! Yes, both of mine are on the counter as I type! Each of those looks ever so familiar even though I’m not usually the one using them. Fun blog, Tammy. My tongs , knives and strainers are really favorites of mine and I agree with the micro-planer grater! Love gadgets! Tongs! now why didn’t I include tongs? Definitely a list to move to a top 20. For my student son (studying Criminology) when he comes home, the WOK!!!! I have a couple of woks and really enjoy them when I remember to get them out. Cooking for just me: small rice cooker. Essential because it perfectly cooks rice, holds food warm, and can easily do other grains and grain mixes. Lower tech, I’m a fan of the large slotted spoon. i only just got a rice cooker this year (a gift). I just haven’t worked with it enough to feel like it’s essential. Slotted spoon? definitely! You know, it’s funny. I’m spending the day in the kitchen and when I went to reach for my slotted spoon realized that my name is on it. I don’t want to lose it at a potluck or something. Epic list, Tammy. I agree with each and every one: especially the sharp knife. There is nothing more frustrating than a blunt one. just the dull part is dangerous! Awesome list and so helpful for us not so good at cooking, to know! 🙂 I’m using tongs a lot these days. And something that I really liked, that broke, was a cheese slicer. It was on a little wooden board and just kind of nice to use! Sounds interesting. I tend to just use a sharp knife. A friend of mine has a mixing bowl with a handle and spout, such a great idea. Hmm scissors are a definite, a good heavy sharp knife, a good heavy pan, and a wok would be the first things I think of. We use the wok for everything – stir frys, curries, pasta sauces, you name it! We just got the Vitamix last week. Using it multiple times each day! What an invention. We’re making stuff up as we go… What fun! Great! did you see a demo and is that what snagged you? Love this list! I also can’t live without my Microplane or my cast iron skillet. And the unique thing is that one is old and one is new. Love your kitchen tools list, Tammy. These (aside from the coffee grinder and cast iron skillet) are my most used/favorite simple kitchen tools, too. What type of pan do you cook in? After my surgery, needing to eat as healthy as possible, I invested in a “green” nonstick pan. It was pricey… but works well and the finish is holding up perfectly. Surgery. Oh gosh, did I miss that? let me know via email if you prefer. Great list! Don’t have all the items you list, but most and of all of them the two most essential are the coffee bean grinder (Must.Have.Coffee.) and the iron skillet – I bought mine in 1976 and use it constantly. Yep. Need the grinder and I’ve had my skillet a really long tme. 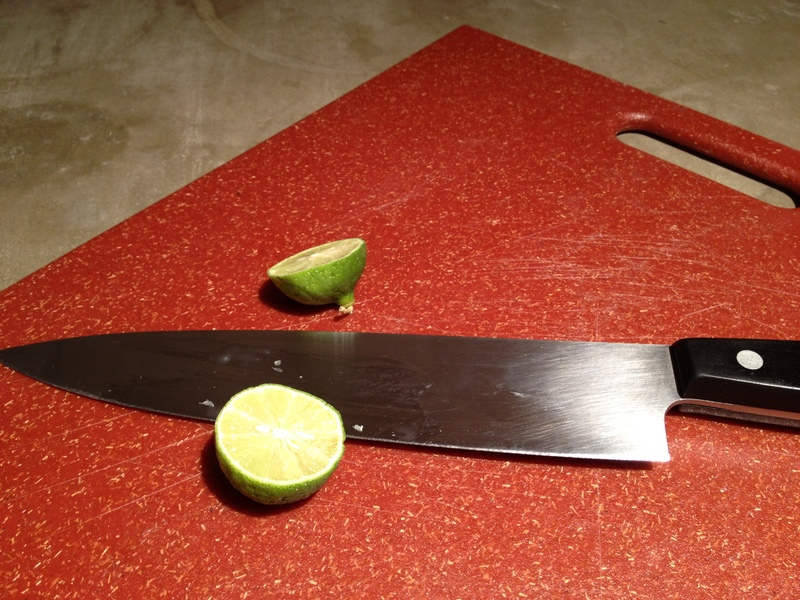 Love your kitchen tools! 😀 And I also hold a deep love for forks with wooden handles! My favorite kitchen tools are my super sharp chopping knifes and wooden cutting board, my steel colander, my frying pan and new BBQ griiling pan ( 😀 ), my cast iron pot and my blender! I don’t use glass measuring pots anymore since I’ve broken all of them in one day (!!) – now I have a plastic one, but at least I can’t break it! I don’t have a steel colander as it would react with many things that I put through it. Love that you have a grilling pan! photo? 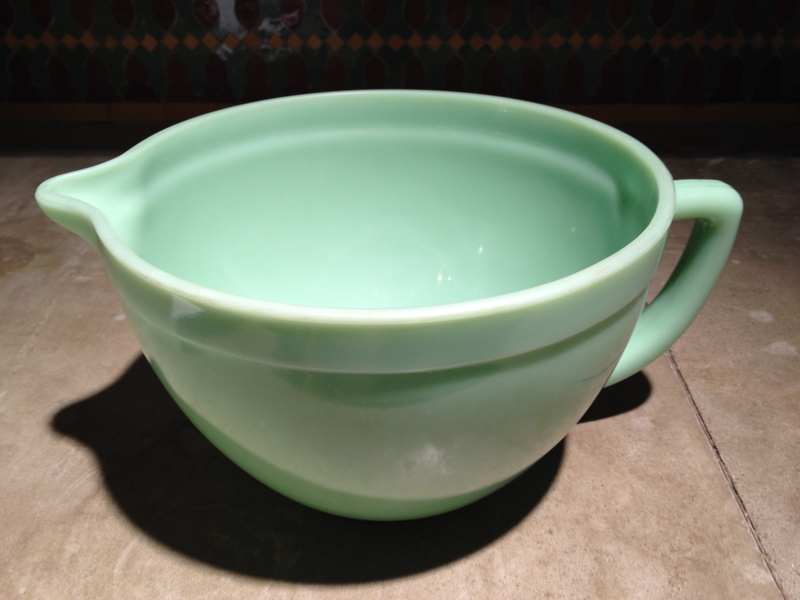 I love your kitchen essentials a lot, especially the lovely greenish mixing bowl: looks just beautiful & elegant too! 🙂 I am also in love with the Microplane grater, it is the best! 🙂 A lovely post! Great list. I like the fact that only one item is electric, and only three items were plastic! I’d add a set of metal mixing spoons, spatulas, measuring spoons, and baking sheet. I think I have to have plastic for the kefir but haven’t really looked for other alternatives that won’t react with fermentation. Ooh, good one — I identified with just about all of these. I’d like to hear your top ten list (or wishlist) of things for preserving the harvest. I’m kind of contemplating getting a food saver and a dehydrator. Not considering a pressure canner, because they scare me. Should they? Thanks for another great post, Tammy! Gee, I don’t know if I have ten. I do have a dehydrator and while I enjoy it, it’s not a frequently used item and I didn’t originally get it for preservation. Pressure canners scare me too although my grandma would laugh at that. She’s a pro. I’ll think about a list. I totally agree with every single item!